Pension Dana will give you a pleasant, professional approach and superb cuisine. We would like to invite you to our newly refurbished guesthouse with friendly family atmosphere and 36 beds in bedrooms ranging from twin/double to five-bed bedrooms. The new apartments are located in close proximity to the mountain home Benecko in the Giant Mountains. The chalet Karolínka is the most highly situated chalet in the picturesque enviroment of the highland village Benecko. 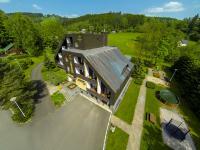 Hotel DIANA is located in Benecko, in the Krkonose Mountains, at an elevation of 900 m above sea level, and is open all year long in a quiet environment. Pension Mejsnar und Privat Mejsnar bieten ganzjährige Unterkunft in einem zum schönsten Teil des Riesengebirges an.